It’s been a while since I posted anything, as I’ve not really tried anything new for a while. With the recent spell of warm weather, it’s been perfect for ice cream. I usually buy Tesco’s dairy free ice cream sticks, but finding myself in Sainsbury’s and in need of ice cream I thought I’d give the Swedish Glace ones a go. They come in a pack of five (compared with Tesco’s three pack), but they are really tiny, like a mini Magnum. Two bites and they’re gone. The chocolate flavoured coating is a bit too thin and not chocolatey enough for my liking. I like a crisp dark chocolate coating that cracks when you bit into it. This one just sort of melts as soon as it gets anywhere near your mouth. Once inside though, the vanilla ice cream is fantastic. It’s really creamy and full of a rich vanilla flavour. It’s definitely high quality ice cream. But it’s gone so quickly! If you’re looking for great ice cream and don’t mind the size, these are probably for you. If you want a decent sized lolly with a good coating of chocolate on mediocre ice cream, go for Tesco’s. If only we had Mercadona supermarket’s own brand Hacendado in the UK. They tick all of my ice cream boxes. Me: Do you have any of your vegan cocoa and pear cake? Server: No, the only vegan cakes we have are the salted caramel and passion fruit cakes. Me: Do they have nuts in them? I’m allergic to nuts. Server: I don’t think so, let me just check. She gets a typed piece of paper out of the folder, looks at it. I look at the typed list of ingredients in the salted caramel cake, and 2nd or 3rd on the list is cashews (not in bold type). Me: There are cashews in it. At this point we both read through the list of ingredients, which seemed to be mostly coconut based. I purchased a slice of this for a whopping £5.95, and carefully carried it to the station for fear that a hurrying commuter might knock it out of my hand. It got there in one piece. On the train I opened the little box. The cake looked pretty and inviting and I was looking forward to trying something new. I stuck my fork on the pointy end, and as soon as it reached my mouth my spidey senses were telling me that something was not right. I’m lucky that when I eat something I shouldn’t I get strange taste in my mouth, usually accompanied by a tingling feeling. My alarm bells were now ringing. I quickly went onto Le Pain’s website to find their allergen information, but there wasn’t any. I then did an internet search for “Le Pain Quotidien Allergen Menu.” This came up with allergy menus from January and March 2017. I searched the menu and there were no passion fruit and beetroot cakes listed. I then did a more general search for “Le Pain Quotidien passion fruit cake recipe.” This took me back to their website, and the menu, but no ingredients. The only passion fruit and beetroot cake I could see was a Passion fruit and Beetroot raw nut cake. Uh oh! The clue’s in the name. Interestingly the menu doesn’t say that this item contains nuts and there is no allergen information present at all. I thought by law they had to inform people if there are allergens present? Anyway, just to be on the safe side I called them (from the Quiet Zone, I must add. I wouldn’t usually do this and I’m the first to tut and roll my eyes but at this point I was getting concerned that I might have a full blown allergic reaction on a train that was an hour away from home). The lady I spoke to was very nice. She started reading the recipe; passion fruit, coconut cream, cashews…. Hang on!! Cashews? You haven’t eaten any have you? Yes! She offered a refund next time I’m in. I was less bothered about the refund than why both the server and I had missed the crucial piece of information that the recipe contains nuts. I’ll probably never know the answer, and can only assume it was missed off the recipe when it was typed up, or somehow we both missed it as it wasn’t in bold type. Had I known the name of the cake before purchasing it, I wouldn’t even have considered purchasing it, but unfortunately I didn’t see a menu and the full name of the item was never mentioned in the conversation I had with the server. In a mild panic, I promptly swallowed three antihistamines and guzzled an entire bottle of water (the idea is to flush the allergen out). I then located the train guard and told him I was having an allergic reaction and where my epipen was kept just in case. It turns it that apart from being extremely dozy from the antihistamines I was ok. It’s great that my body warns me that something isn’t right, and I’m able to catch it early. Had I eaten the whole thing it could have been a very different story. Le Pain Quotidien really need to sort out their allergen information. It needs to be clear and readily available, and I will be writing to them to this effect. I think the moral of the story is check the ingredients. Then check again. Or just don’t buy the cake in the first place. It’s better for the wallet and the waistline! I saw the manager this morning. She was very apologetic and gave me a refund. She will raise the issues of training and allergen information with their food standards people. She also pointed out that it’s called a “Nut Cake” for a reason!! Lesson learnt, I will always look at the menu in the future! It has always been a tradition for my kickboxing class to go for a cheeky Nando’s after class on a Wednesday. I’m not sure where this originated, but it’s quick and easy, and packs the protein needed after a workout. In true tradition we met at Nando’s in Gunwharf Quays yesterday evening only to find that our group of thirteen couldn’t be seated together and there would be a wait of 45 minutes to an hour. Why so busy, we thought, then it dawned on us that it’s half term. We split up and trudged around every food establishment in Gunwharf looking for an available table. Just as we were about to settle for a few plastic tables in Burger King, Giraffe said they could fit us in. They moved tables around and made space for us to sit as a group, which was no mean feat at such short notice. I’ve never eaten at Giraffe, but I knew that their philosophy was to serve food from around the world, so thought there must be something on the menu that’s Allergy Girl friendly. 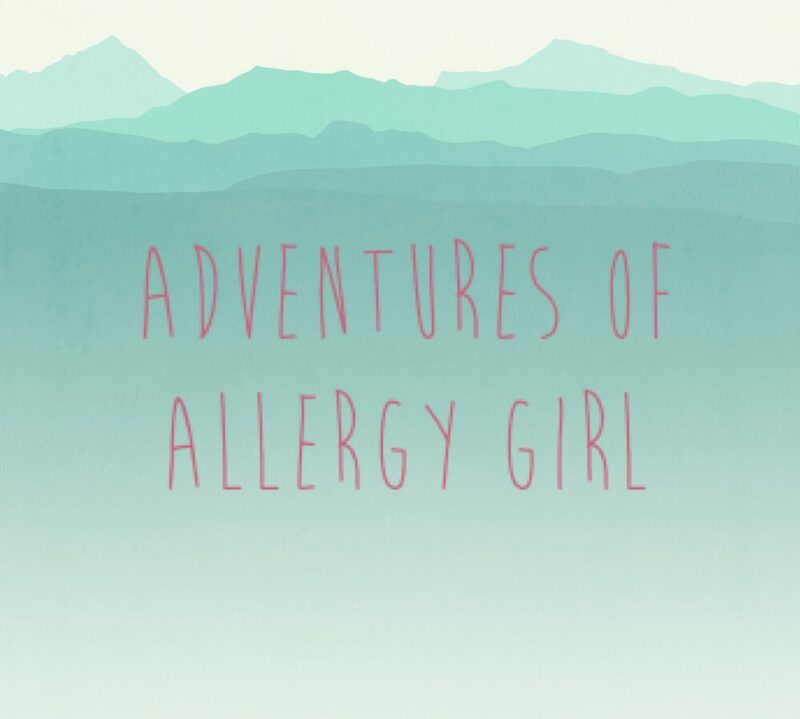 Not wanting to cause a fuss, I went onto their website and found their interactive allergy menu, which at a first glance looked good. It allowed me to tick the different allergens and would show the dishes that don’t contain those allergens. In theory…….. In practice it was just wrong. One of the items it said I could have was the Bao Buns, so I looked at these on the main menu. In small letters underneath the description of the dish it said “please be aware the buns are topped with peanuts.” Now we had a problem. By this point everyone was ordering and I still didn’t have a clue if I could eat anything on the menu, so I asked the waiter the question they all hate to be asked. He brought the allergy menu over, took the rest of the orders and said he’d give me a few minutes to look at it. The allergy menu was fairly standard looking. It had a grid with the main allergens, and there was a tick in the box if it contained the allergen or “M” for might contain. The only problem was the grid clearly didn’t fit the A4 paper it had been printed on and half of each dish name was missing, meaning I had to guess what it was I was actually looking at. This took forever and I was getting fed up. I wasn’t convinced by the allergen information on the allergy menu either. For example, it told me there was no milk present in the chicken curry with naan bread, but as naan is usually made with butter or ghee I thought this was incorrect. I eventually settled on a steak with sweet potato fries and a side salad, as you can’t go wrong with meat and veg. The steak was a little rarer than I’d normally have it, but it was delicious and I’d definitely have it cooked that way again. The salad of spinach, rocket and cucumber was nice and made a welcome change from the watery iceberg lettuce that often accompanies steak in chain restaurants. I spoke to the waiter about the allergy menu, pointing out that the website didn’t work and that you couldn’t read the paper menu properly. He said they were aware of the problems with the website and the paper menu was only a temporary solution while the website was being sorted. I personally think it’s not good enough. It’s hard enough when you have an allergy trying to work out what you can and can’t eat. The information you’re given needs to be clear and accurate. Allergies are not be taken lightly and one small error in allergen information could kill someone with a serious allergy. Although the food was nice, I won’t be going back as Giraffe simply do not take their responsibilities towards customers with allergies seriously, and probably won’t until they find themselves trying to defend a compensation claim or prosecution. I like cinnamon. I like doughnuts. I like cupcakes. Therefore I like cinnamon doughnut cupcakes! I’ll get the disclaimer out of the way early. These are not doughnuts. They just remind me of the hot cinnamon doughnuts I used to get at Bognor Regis beach when I was younger. As no frosting is required they’re quick to make and are super yummy whilst still warm from the oven, just like the doughnuts from my childhood. The recipe uses my Basic dairy and egg free sponge recipe. 1. Make as per Basic dairy and egg free sponge recipe. At step 3 add 1 tablespoon of cinnamon with your flour. 2. While the cakes are baking, mix together the light brown sugar and 1-2 tablespoons cinnamon in a small dish or bowl (must be larger than the circumference of your cakes). These amounts are approximate and you can add more or less cinnamon depending on how you like the taste. If I end up mixing too much cinnamon sugar, I keep the leftovers in a Tupperware container ready for next time. Pour the olive oil into a small dish or bowl. 3. Once baked and still warm, brush the olive oil onto the top of each cake with a pastry brush, then dip into the cinnamon sugar mixture. 4. Leave to cool or eat straightaway!! I’d love to know how you get on and what you think of these little gems (that are my 87 year old Nan’s favourites). Happy baking! !